A pickup flipped off the Samoa Bridge. There have been at least three car crashes in the Eureka area in the last hour. Two vehicles collided at the intersection of Buhne and J Streets about 12:19 p.m., according to the scanner. An ambulance was responding. There is one way controlled traffic on Buhne. J Street is closed to through traffic. Meanwhile, two vehicles collided about 12:25 p.m. near the intersection of 14th and B in Eureka, according to a report relayed by the emergency dispatcher. An ambulance was also responding to that crash, which closed.14th Street between A and B Streets, according to an officer at the scene. 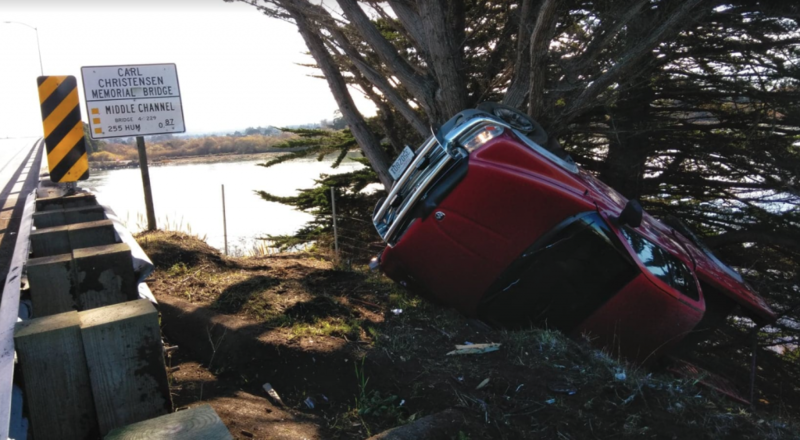 Earlier today, at approximately 11:25 a.m., a Dodge Dakota pickup truck hit a guard rail on the second span of the Samoa Bridge, throwing it over the side and into a tree. Neither of the occupants was injured.